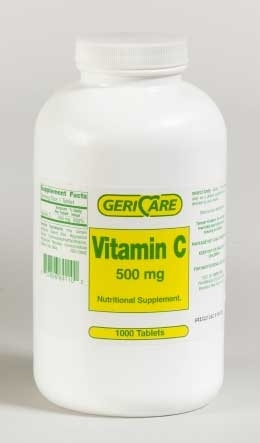 Geri Care Vitamin C 500 mg Tablets come in a bottle of 1000. Vitamin C is essential for normal growth and maintenance of your body. It an antioxidant that protects cells against damage, and fights infections. It also promotes healthy bones, teeth, gums and blood vessels, It also aids in the absorption of iron. Vitamin C is a water soluble vitamin which means that your body doesn’t store it. Other Ingredients: Microcrystalline Cellulose, Steric Acid, Hypromellose, Croscarmellose, Sodium, Magnesium Stearate and Silica. Directions: Adults - One tablet daily as a dietary supplement, or as directed by your doctor. As with any supplement, if you are pregnant, nursing, or taking medication, ask a health care professional before use.